Here at CoinFi we’ve been pedal to the metal for the past few weeks, and we’ve finally reached a point where we can come up for air and give you all a more in-depth update. We’ll give a recap of the tokensale and an update on token metrics (supply etc). We’ll talk more about the upcoming airdrop for those who passed KYC but missed out on the tokensale. We’ll save the best for last, and talk about our upcoming Kucoin listing! As many of you are now aware, demand for our crowdsale was incredibly high. We were featured on many “Top upcoming ICO” lists, and ended up oversubscribed. For those of you who might be just discovering CoinFi for the first time, CrushCrypto did a very well-balanced, independent overview of our platform and gave it a positive recommendation. 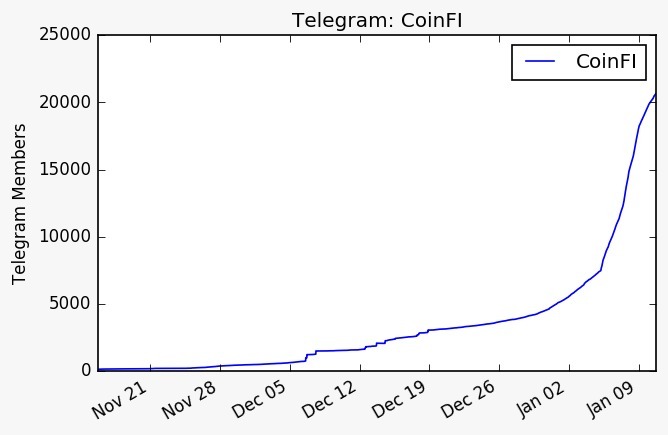 ﻿ In early January 2018, our telegram channel experienced viral growth and was one of the fastest growing telegram channels leading into our ICO. With the extreme demand combined with a surge in Ethereum price, we ended up hitting our $15M USD hardcap before our public sale even opened. We turned away a lot of private investor funding in order to reserve allocation for the crowdsale, but the rising ETH prices made us hit our hardcap early, and we chose to honor that hardcap. We’re expecting demand for the platform to be equally high, so if you’re interested in accessing the CoinFi platform (more details on the platform below), you’ll want to pick up tokens on Kucoin as soon as you can. Because performing a tokensale was no longer an option, we decided to airdrop 500 COFI tokens to everyone who was already whitelisted, as well as reduce the platform access staking requirements for those 18,000+ whitelisters. The airdrop will take place this week, prior to our listing on Kucoin which will take place on Jan 29th, and we’ll let you know as soon as it’s taken place. Airdropped tokens will be locked until Jan 28th, the day before the exchange listing date. We did initially state that the tokens would be unlocked when the airdrop took place, but that was not going to be until January 31st, so either way, you’re going to get to use your tokens sooner than you would have originally. For those of you who passed KYC on the whitelist, you don’t have to do anything in order to receive the tokens (as long as you submitted a valid ethereum address that you own – i.e. not an exchange). Many people have asked us for details of the smart contract in order to add tokens to their MEW wallets to receive the tokens. You do not need to add a custom token to MEW or any other wallet in order to receive the tokens. Any valid ethereum address can receive erc20 tokens regardless of the wallet and regardless of a custom token having been added. Additionally, you can’t actually add a custom token until you have received it anyway. Once the airdrop has taken place, we will include the smart contract address and details for how to use the token on MEW and Metamask. For now, you don’t have to do anything but wait. We are absolutely thrilled to announce that COFI tokens will be listing on Kucoin on January 29th. Kucoin is one of the largest, and certainly fastest growing exchanges, and we’re excited to have them as our first exchange listing. COFI will be paired with both Bitcoin and Ethereum upon listing, so if you are interested in purchasing COFI you will want to set yourself up with a Kucoin account and deposit either BTC or ETH to it in advance, to avoid delays once we list. More info on how you can win these prizes can be found on the KuCoin announcement page here. * subject to change, note this minimum requirement is only 2,500 for those who whitelisted. We will also have a basic free level too. As we build out the platform, demand for the token is going to increase, so if you’re interested in accessing the CoinFi platform and getting the COFI token early, it will be available on Kucoin.com January 29.